Being based in Ayrshire, South West Scotland, I like to explore what's on my doorstep when I can and share my adventures. 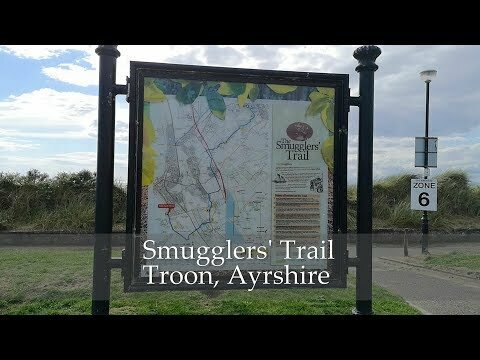 A few years ago I wrote a blog post about the Smugglers' Trail in South Ayrshire and now I've created a video of the trail showing all the points of interest along the way. A long time ago in a shire far away ... the 18th century Loans Smuggling Company was the most successful in Scotland. Goods like tea, brandy, wine, rum and tobacco were bought tax free from the Isle of Man and shipped to Troon. Local men with their horses would gather on the beach to quickly carry these inland. One route was through Dundonald Glen. You can walk the trail either from Troon to Dundonald or vice versa. For my video I preferred to walk it the way the smugglers would carry their goods inland. I hope you enjoy this historical Ayrshire trail as much as I did. You can also read another full walk report including a map on Gillian's Walks website. This is a brilliant blog with walks all over Scotland including buggy friendly, dog friendly and walks the kids will enjoy. I love your video and the storytelling along the way! It makes me feel like I did the trail with you. Thank you!